It’s arguably Melbourne City Council’s most shameful heritage failure in recent memory. 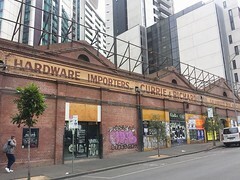 Councillors have variously sat on their own hands, ignored the advice of their own heritage experts, and ignored the pleas of their own constituents in allowing the demolition of the former Burton’s Livery building at 50 La Trobe Street, a gorgeous, recognised, C-graded 1868 Victorian former carriageworks, in a relatively unique (for the CBD) Italianate style. Mayor Doyle’s leadership on this issue has been particularly abysmal. The Lord Mayor of Melbourne, in THIS day and age sees greater imperative in property developers not having the value of their entirely speculative purchases potentially fractionally lowered, than in exercising his duties as custodian of our collective, recognised, and formally-graded civic heritage. 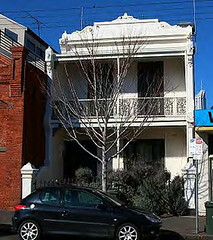 The building was left unprotected when in 2011, Council decided to ignore the advice of THEIR OWN HERITAGE EXPERTS in allowing the demolition of its twin building at 40 La Trobe St for an apartment tower, and ignoring contemporaneous recommendations to protect the rest of the streetscape. This is despite the building having been recognised and graded “C” in Council’s 1984 Heritage Survey. That survey was SUPPOSED to be the basis for determining which buildings were protected by heritage overlays, but the process was incomplete, and a number of graded structures never had heritage overlays applied. The omission in this case was apparently due to this small section of La Trobe Street actually sitting outside the CCZ “Capital City” Zone of the Melbourne Planning Scheme, again seemingly because of administrative quirk rather than any meaningful planning intent. MHA has collected the names of over six hundred petitioners, all of whom specifically called on Melbourne City Council to recognise its obligations and protect the site. It now appears all these calls have been ignored. In the absence of any heritage overlay, Council Officers have been forced to this week issue approvals for the proposed apartment development, which includes permission to demolish the former Burton’s building. Council Officers are powerless to consider heritage where Councillors have neglected to apply any formal protection. So now, for the sake of all this beaurocracy, Melbourne is about to lose another treasured slice of its heritage dating to 1868. And it’s going to be replaced by … nothing. A void. A “laneway” by the developer’s description. And on that basis, the idea that this building HAD to be demolished for any development proposal here to be viable, is a TOTAL furphy. We do not believe that those who oversee a heritage crime of this scale should go without feedback concerning their actions. The following are the email addresses of those Melbourne City Councillors who have collectively voted to ensure this outcome. If you are ANGRY about this TOTAL FAILURE of Councillors and the Lord Mayor to exercise their most basic duties to future generations, we suggest you, their constituents should politely inform them how history is going to regard them. As numerous Councillors were SUPPORTIVE of MHA’s position – albeit not numerous enough – petitioners should channel their energies towards the offices of COUNCILLORS and the Lord Mayor. We do NOT encourage personal attacks or abuse in lobbying as it is always counter-productive. But we do feel this should NOT be the end of the story for those responsible. Hi Anne, we did run a petition last year that was presented to councillors. unfortunately public opinion seems to have carried little weight in this decision. Are you short sighted council fools serious? At least keep the facade. Melbourne is starting to look like it could be a soulless city anywhere in the world. Tourists go to Paris for its charm, its history, its beatiful architecture . Tourists won’t come to Melbourne if it has none. History will remember you decision makers and I think you will be remembered harshly as the council that turned Melbourne into an ugly soulless city of mirrored low quality boxes. Sadly Heritage now means nothing for City of Melbourne. Watch out Parkville is next! Melbourne is very quickly I must add, loosing our Heritage and our History. We are loosing Buildings in and around the borders of the CBD. Do we really need another apartment black in the city, where , at least 40% of apartments are empty and that buildings (high rise) have now been ceased in the MMA. Wake up all you Councillors, it is not YOUR City, it is OURS….. I have given up on the vandals and wreckers who over the years have allowed heritage buildings to be demolished. Let’s face it Melbourne is a great place for Philistines,Bogans and dullards. Pathetic little drones puffed out with self importance. How very sad – such a beautiful building. Architecturally its a very beautifully proportioned building and deserves to be retained. We have lost too much already in the name of “progress”.